If your wondering what to get your favorite former Altadenan - someone who has moved away from our lovely community - consider purchasing Altadena: Between Wilderness and City by Michele Zack. 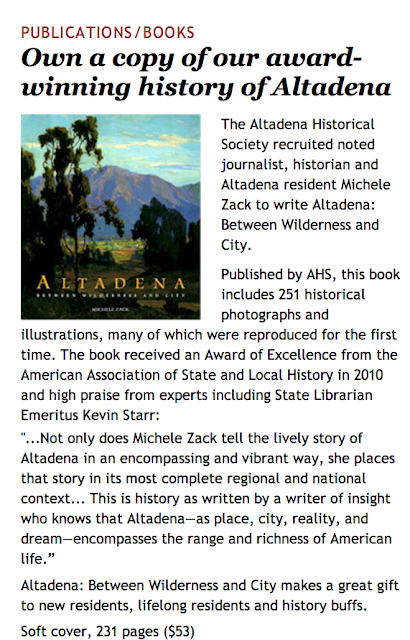 You can purchase the book online, or send a check to AHS, 730 E. Altadena Drive, Altadena CA 91001. The book is $53 and that includes tax. Add 5 bucks for shipping. BUT …if you live in Altadena, your total cost is only $53 (no shipping) because one of our volunteers will drop the book off at your house! That's old fashioned service.